Merrick’s Model 475 belt scale is modular with at least one weigh idler comprising the complete weighing unit. The scale is easily installed in existing conveyors and offers extremely simple and accurate alignment of the weighing area. The principle is shown in Figure 1. 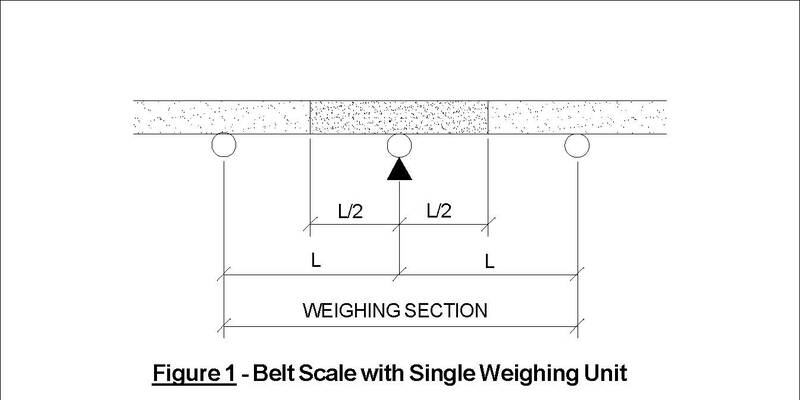 Weighing errors from the belt are mainly caused by variations in belt tension, therefore the scale should be installed in conveyor locations that minimize tension effects. 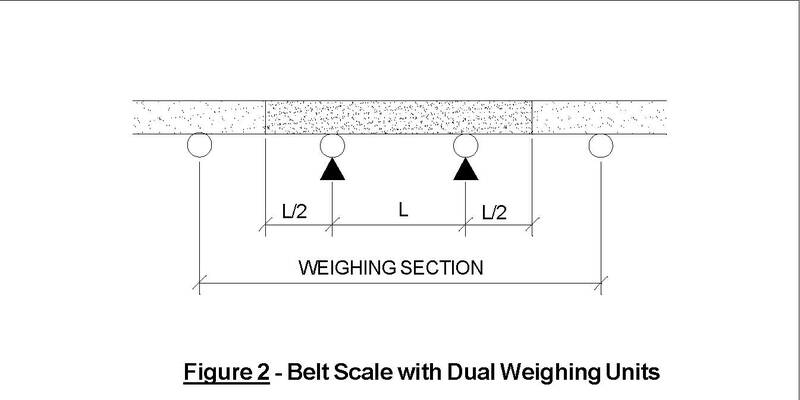 Belt tension should be as low as possible, without incurring belt slippage (see Section 3). Idler spacing (L) should be increased for greatest accuracy. However, the weigh span length will be limited by cantenary effects, increased belt wear, and material spillage. Adjacent idlers and the conveyor frame itself must also be satisfactorily rigid (see Section 3). These measures are usually not costly and offer simple weighing unit installation. If these mechanical conditions cannot be satisfied, errors will be considerably greater. However, they can be reduced by the incorporation of additional weighing units. To achieve better accuracy than that attainable with a single weigh idler (or if a scale must be installed in a conveyor with considerable variations in belt tension), simply install an additional weighing unit in the conveyor, as shown inFigure 2.
the 2-idler configuration permits accuracies of up to 0.25% of test load. this configuration satisfies legal-for-trade requirements according to Handbook 44. Handbook 44 requires an acceptance tolerance of +/-0.25% of test load for conveyed quantities between 35% to 98 % of the rated capacity. This standard also requires repeatability between material tests of 0.25% (1/400). The choice of weighing unit quantity depends upon: (1) accuracy requirements, (2) scale location constraints with a subject conveyor, and (3) the conveyor’s structural rigidity throughout the weighing area. 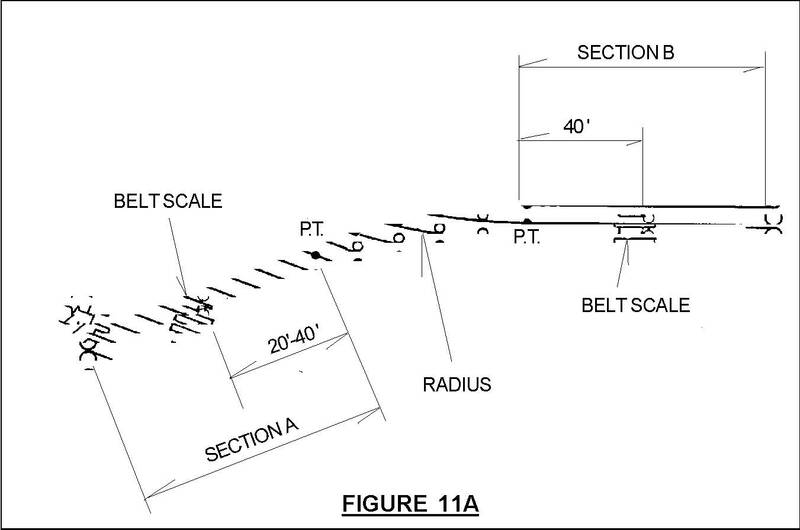 The following section provides the various considerations necessary in optimally chosing a scale location on a conveyor. 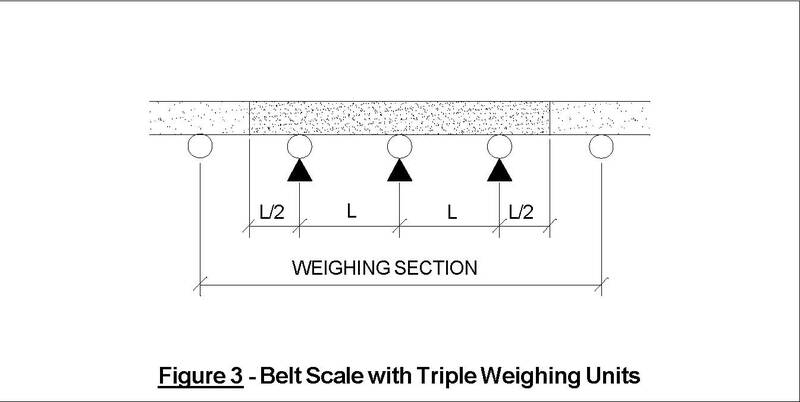 The most important factor in assuring accurate weighing results is the application of the belt scale to the conveyor. Although other factors must be considered in continuous weighing applications, the majority of problems encountered after an installation are traced to improper applications. The key to successfully applying the scale to the conveyor is to avoid locating the scale in any area of the conveyor where it is subjected to excessive belt tension and/or lifting of the conveyor belt. Always remember that the conveyor belt is an integral part of the scale and, as such, must remain in contact with the weigh module at all times. The following application guidelines should be followed to assure the best accuracy. A. 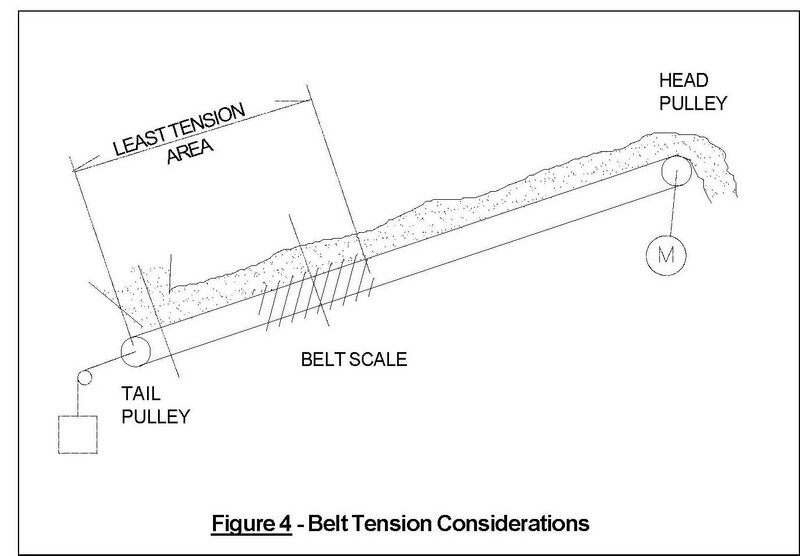 BELT TENSION CONSIDERATIONS: (See Figure 4) The belt scale should be installed near the conveyor tail pulley to minimize the effects of the belt tension. The tail end of a conveyor has the lowest amount of belt tension and, even more importantly, the lowest amount of tension variations. The conveyed material requires settling time at the infeed before approaching the belt scale weigh span in order to achieve accurate weight measurement. The distance from the end of the infeed skirt-boards or loading point to the first weigh idler is minimally a distance conveyed by the belt in 2 to 5 seconds. If the conveyor is longer than 75 feet, a gravity take-up must be provided to maintain a uniform belt tension. The device shall be of the counter-weighted type with either vertical or horizontal travel. The take-up must not introduce excessive belt tension and should be designed to allow the addition or removal of counter weights. The conveyor structure (particularly in the area of the scale) must be rigid enough to resist deflection under maximum load. Conveyor stringers at the scale and for not less than 20 feet before and beyond the scale shall be continuous or securely joined and of sufficient size (and so supported) as to eliminate relative deflection between the scale and adjacent idlers when under load. The conveyor stringers should be so designed that the deflection between any two adjacent idlers within the weigh area does not exceed 0.025 inch under load. 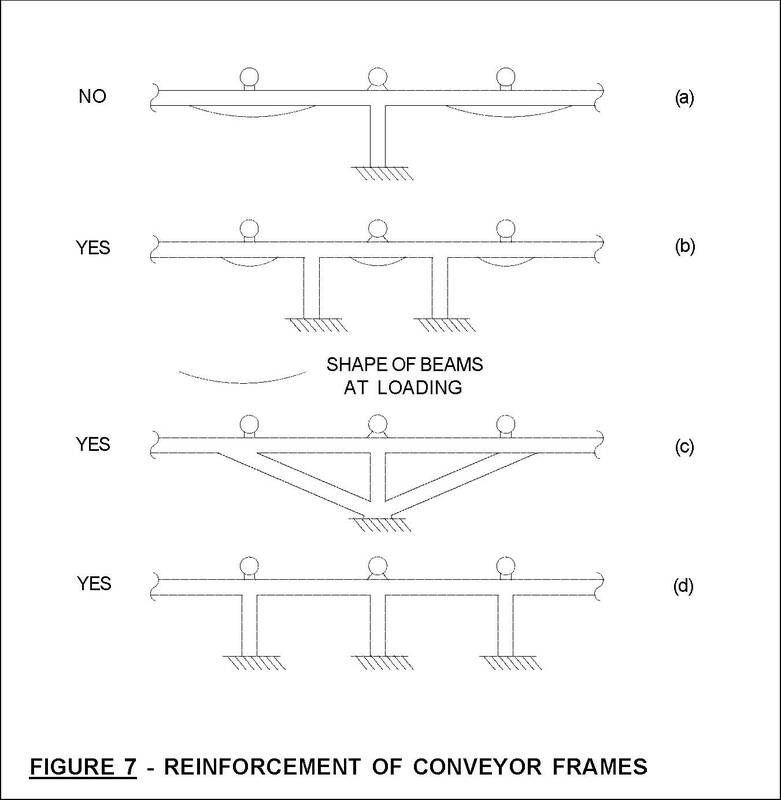 Weakness in the conveyor frame (see Figure 7) is reduced by reinforcing the frame supporting the scale span or by installing additional support legs (Figure 7b) to equalize conveyor deflection at the weigh idlers. 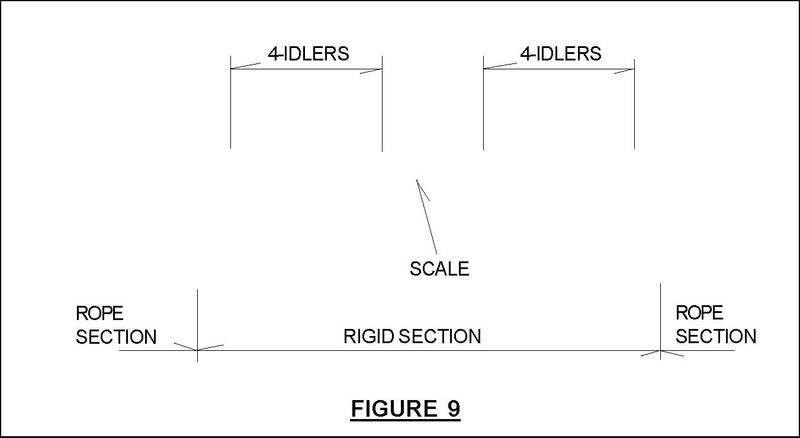 Angled braces (Figure 7c) or supports installed under each idler (Figure 7d) provide the most stable weighing section. Angled braces are usually the simplest solution for tubular frames. 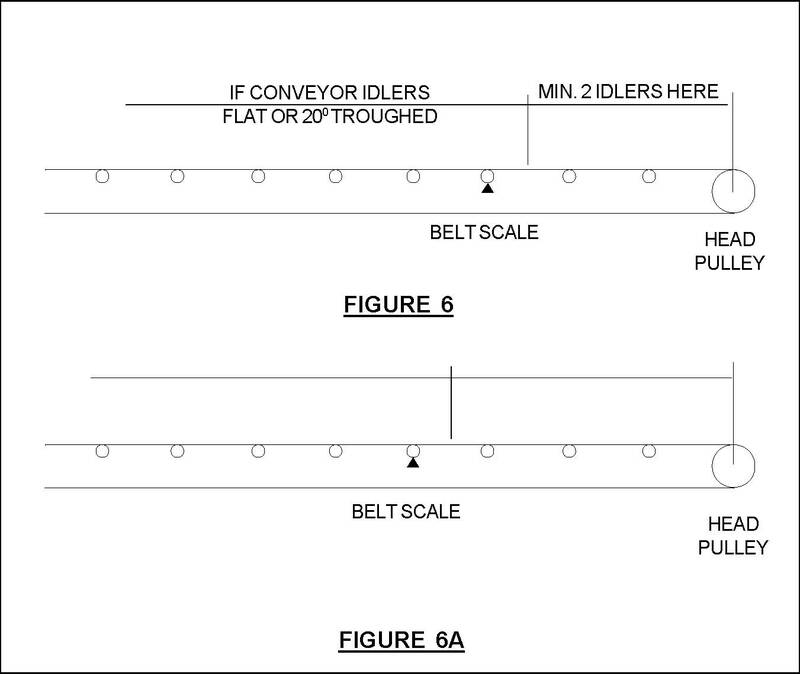 Weaknesses in idlers are usually considerable for troughed belt conveyors. Since the load is imposed at the middle of the idlers (seeFigure 8), the idler beams usually deflect 0.04 inches (1 mm) or more. This leads to considerable weighing error. 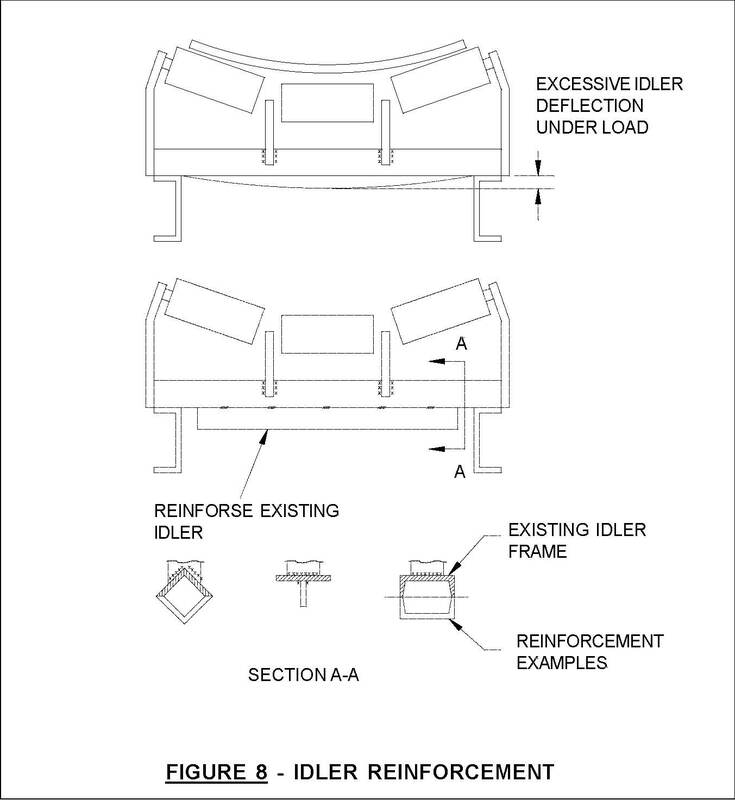 Reinforcement of the idlers adjacent to the scale span (2 approach and 2 retreat) with additional welded beams can minimize weighing errors caused by idler deflection. 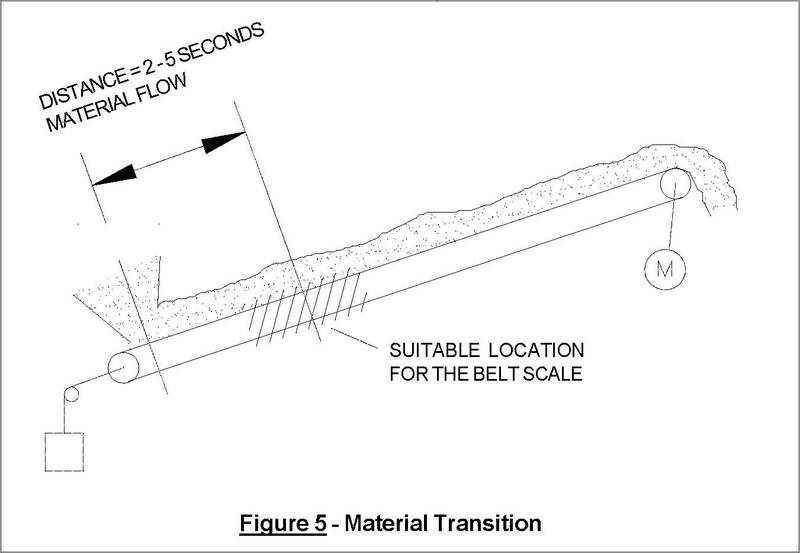 Rope conveyors are not acceptable unless a rigid section is provided for the belt scale as shown in Figure 9. Always use rigid 3-roll in-line type idlers on the belt scale and at least two idlers either side. Do not use offset center roll or garland-type idlers. If the conveyor is inclined, the inclination must be fixed at one specific angle. Portable conveyors are not recommended. The conveyor inclination must not exceed the material angle of slide to prevent roll back and reweighing of the material. If the conveyor is designed with a concave curve (Figure 11), the belt scale must be located 40 ft. from the point of tangency as curves induce inherent mis-alignment. Concave curves require special attention, since the belt tends to lift when running empty. As a rule, errors can be avoided if there is a sufficiently long, straight conveyor section between the scale and the curve. The preferred scale location is shown below the curve in ‘SECTION A’. 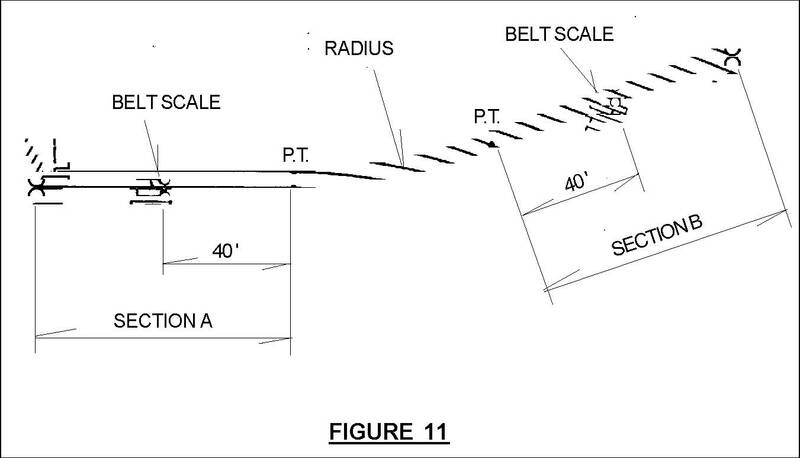 If the conveyor is designed with a convex curve (Figure 11A), the belt scale should be located in ‘SECTION A’. Note: If ‘SECTION A’ (Figures 11 & 11A) is not long enough to satisfy a proper installation, alternate ‘SECTION B’ should be considered, providing material tests can be run to establish a necessary correction factor to compensate for the inherent scale location error. If training idlers are used, they must not be located within 60 feet from the centerline of the weigh span of the belt scale. Belt scrapers or belt cleaners are recommended for materials that tend to stick to the belt and would tend to affect the zero of the belt scale. The conveyor loading mechanism shall be designed to provide uniform belt loading over the belt scale through the full range of the scale operation. If the loading is not uniform, a series of diagonally placed plows should be used to eliminate hills and valleys in the material. Sufficient impact idlers shall be provided in the conveyor under each loading point to prevent deflection of the belt during the time material is being loaded. Wherever possible; avoid installing the belt scale on conveyors with multiple infeeds unless all feed points will be used at the same time. Avoid trying to weigh accurately in both directions on reversible conveyors. The use of two scales is a better solution. If the conveyor is provided with a tripper, the belt scale must be located at a point 40 feet from the point of tangency of the belt with the tripper fully retracted (toward the tail pulley). See Figure 12. The general rule is that control scales require a minimum of one suspended idler whereas an inventory scale (or one that is to be used for a high degree of accuracy) requires at least two or three suspended idlers. There are two overruling factors; (1) belt speed, and (2) weight per foot of material on the belt. The example does not satisfy the design requirements; therefore, one of the following three factors will have to be reviewed. a. Increase the idler spacing. b. Add a second weigh unit. of the belt conveyor system. 300 TPH conveyor running at 150 feet per minute. LB/FT belt load on conveyor= 300 * 2000 (short tons) 150 * 60 = 66.66 LB/FT belt load The weight on the load cell = 66.66 * the idler spacing in feet = 66.66 * 3 = 199.98 pounds The minimum load on a model 475 modular belt scale is 10.00 pounds.